We all experience “senior moments” and even in our forties and fifties, we can be forgetful, confused, and a bit disoriented. We may be able to attribute it to getting older, hormonal changes, or imbalances in brain chemistry as we age. After all, isn’t this normal? How can we tell if these moments are typical, age-related changes or signs of Alzheimer’s? Forgetfulness is very common especially as we age, but it’s critical to recognize when mild confusion or memory loss may mean something much more serious. Memory loss that disrupts daily life may be a symptom of Alzheimer’s or dementia. The disease causes a slow decline in memory, thinking, and reasoning skills. Even today, scientists still continue to unravel the complex brain changes involved in the onset and progression of Alzheimer’s disease. It seems likely the damage to the brain starts a decade or more before memory and other cognitive problems appear. If memory problems are seriously affecting your daily life, they could be an early sign of Alzheimer’s disease. While the number of symptoms you have and how strong they are vary, it’s important to identify the warning signs and ask yourself some tough questions. Do you easily forget information you just learned? Do you lose track of important dates, names, and events? Do you forget significant milestones even happened? Do you ask for the same information over and over, or repeat thoughts or questions to others often? Do you rely heavily on memory aids like post-it notes or reminders on your phone? Maybe you have a “tried-and-true” recipe that you could cook in your sleep, but now you suddenly have trouble assembling it? Is it hard to concentrate on detailed tasks, or do you have trouble making plans and sticking to them? Tasks that require problem-solving and attention to detail might be especially difficult. Another place you may notice an impact is in your financials — you may have trouble keeping track of bills, which will be more obvious if are typically diligent about paying them on time. The mood and personalities of people exhibiting signs and symptoms of Alzheimer’s can change. Do you get upset easily, or feel depressed or anxious? While it’s normal for people to battle depression or experience frustration at times, changes in a person’s basic disposition or temperament aren’t normal and may be cause for greater concern. Perhaps you or your loved one is exhibiting unusual behavior? Are you more prone to wandering, wearing clothes that don’t suit you or your environment, or engaging in “unsafe” behaviors? Are you having trouble following or joining a conversation? Perhaps you have stopped in the middle of an ongoing dialogue with someone, and have no idea how to continue, or you repeat yourself. Do you struggle with vocabulary, have problems finding the right word, or call things by the wrong name? Everyone misplaces things from time to time, but can you retrace your steps to find them again? Do you put things in unusual places, like placing your wallet in the refrigerator? Do you accuse people of taking things that you later find you misplaced? Many people with Alzheimer’s disease may experience changes in judgement or decision making. You may even find yourself doing things that are very out-of-character and atypical of your personality. Are you using poor judgement when dealing with money? Giving large amounts to telemarketers or others? What’s more, you may be paying less attention to grooming or keeping your home tidy. A person with signs and symptoms of Alzheimer’s may start to remove themselves from hobbies, social activities, work projects, or sports. You may even have trouble keeping up with your favorite sports team or remembering how to complete a favorite hobby. You also may avoid being social because of the changes you’ve experienced. If you notice any of these warning signs in yourself or someone you know and love, don’t ignore them. Schedule an appointment with your doctor. With early detection, you can explore treatments that may provide some relief of symptoms and help you maintain a level of independence. 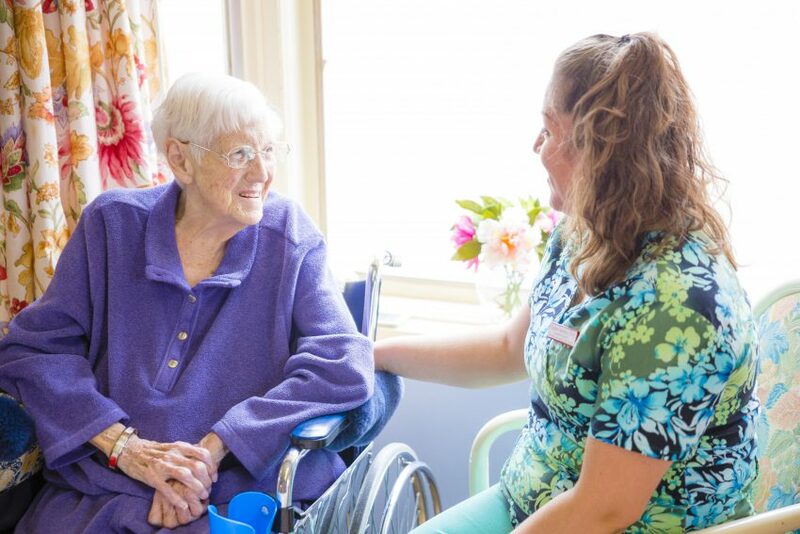 Elmhurst Extended Care Center has a secured certified memory care unit for those with dementia and Alzheimer’s and our dedicated staff understands the challenges you face when dealing with these memory-related diseases. Alzheimer’s disease progression can be slow, but the impact it has on families can be difficult to process. The most important aspect behind this emotionally-painful disease is that you are not alone. Rely on Elmhurst Extended Care Center to be your support and resource center. For additional guidance and information for those facing Alzheimer’s and dementia, check out our regular Family Support Groups. Contact our facility today to find out when the next group will be held.